There’s a local restaurant my husband and I go to frequently. One of my favorite things on the menu there is Chicken Parmesan. 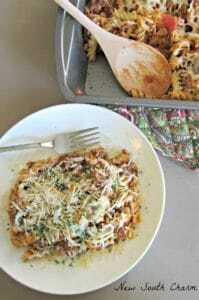 Baked Chicken Parmesan is my twist on that dish. I use baked chicken instead of fried to make it a little healthier and a lot easier to make without giving up any of the flavor. This recipe calls for baked, chopped chicken. To prepare the chicken season it with salt and pepper and then place it in a preheated 350º oven. Once the chicken is in the oven I start the pasta and let it cook while preparing the sauce. The sauce is easy to make. In a large bowl combine diced tomatoes, tomato paste, Italian Seasoning, garlic powder, and sugar. Add cooked pasta and chicken to bowl and mix until evenly coated. Transfer mixture into a prepared casserole dish and place in a preheated oven for 30 minutes or until cheese is bubbly and golden brown. After removing the pasta from the oven sprinkle with Parmesan cheese. Serve with a side salad and warm crusty bread. Thank you so much for reading! Are you following New South Charm on Facebook? I’d love to hear from you; drop by and say hello! 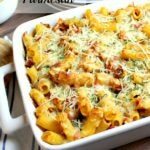 Looking for more great PASTA recipes? 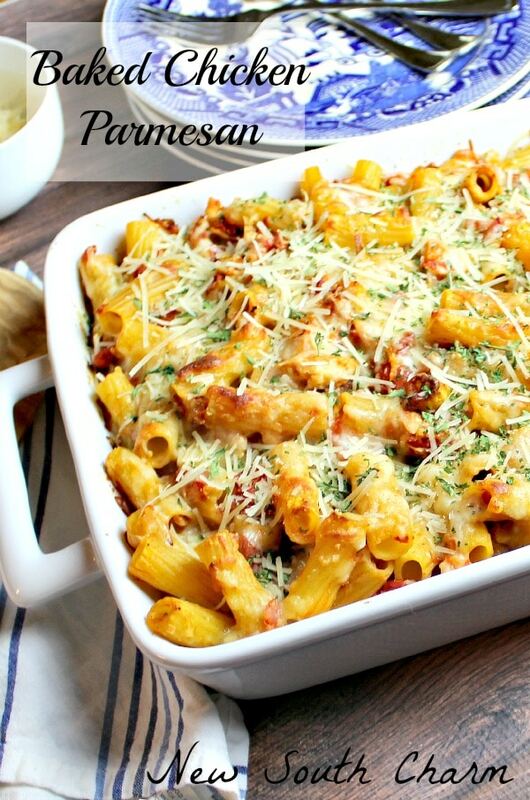 Oh I just love Chicken Parm, so I am so excited to see a casserole version of it that I can enjoy more than one night! It looks fabulous! 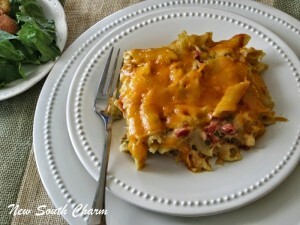 Thi sis a great recipe Susan and it’s almost better the second day. i hope you love it as much as we do! Looks yummy. 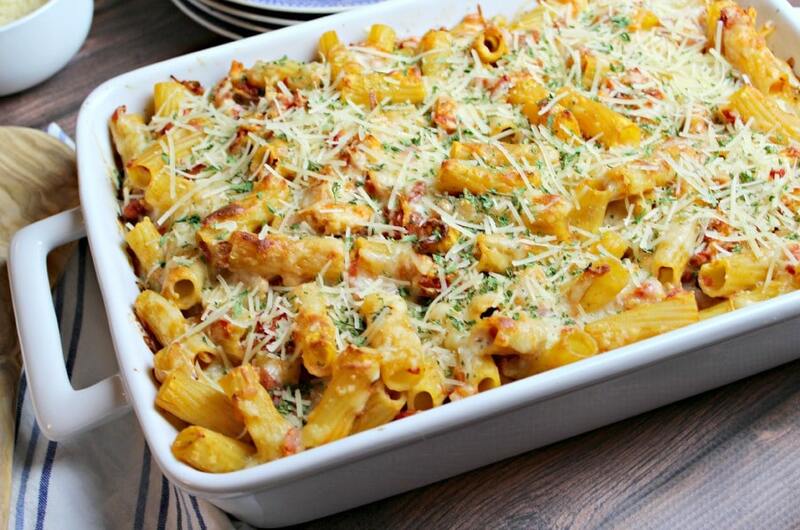 This may be on the Italian dinner plan we have for our family on Christmas Eve. It’s Italian this year. Thanks Debbie! It’s a great dish and it can defiantly feed a crowd. I like your family tradition of Italian food on Christmas Eve. I’ve never heard of anyone doing that. I might have to try that out next year. Susanne, I’m sure you have planned make me hungry, right?? Love any kind of pasta! Wow this looks good! I love every ingredient! 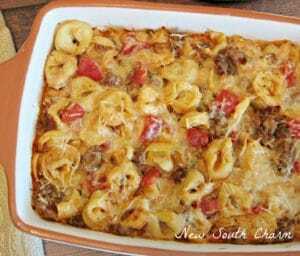 Yummed and pinned so that I can find this recipe when I need it! This looks absolutely amazing Susanne! I am adding it to my menu this week! I love dishes like this – easy to make and little clean up! Plus I know my family will love it too. Thank you so much for featuring my Baked Chicken Parmesan. What a great Christmas surprise! I hope you’re enjoying the holiday season. Just a simple girl raised in the South who loves to cook. I've tried recipes for everything from ambrosia to zucchini. My favorite foods are the ones that bring family together. I love to spend time in the kitchen. I'm so excited to share my kitchen with you!